To ship your item(s) to your specified address, you will need to cover some of the following fees. Once the 2nd payment is complete, international shipping will commence immediately. However if you are unable to cover this fee within the 10 day scheduled time-frame, your item(s) will be placed under Unpaid Items. Regrettably your account might have to be temporarily suspended until this outstanding payment is cleared. Unfortunately, if you do not wish to continue the purchase process, please refer to our Refund Policy. As a measure of our appreciation to all our members we strive to minimize your overall costs with our time limited low service fee greeting voucher. You can find this voucher in your Mogan Shopping account (My Account) once you register and sign up. Please also take a moment to look at our VIP Membership Reward Programs for further discounts. For more info please contact us and we will answer any of your questions. Tips on Smart Shopping: If you buy up to 10 items from the same seller within a 48 hour buyer session, a purchase consolidation discount will be made available after checkout. For this condition, we only charge one service fee. Thus our total service fee will be a fixed rate of 900 Yen, only 90 Yen per item of 10 items per order package. A new order will be generated if you purchase more than 10 items. For details on how to manage your order, please go to About My Order or go to Smart Shopping. This is a fixed fee of 350 Yen for each order number, charged by all Japanese banks. This will be shown in your Mogan Shopping account via 'My Account', under ‘Order Info > All Orders > Order Number > 2nd payment’. 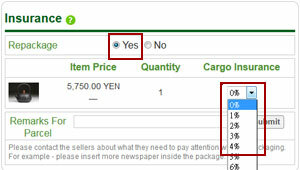 Japan's domestic shipping fee is equal to the actual delivery cost from the seller to our Japan Mogan warehouse. No charge will be applied if the auction item is marked as 'Free Delivery'. For some conditions, if the seller agrees to send items directly to your address, the Japan domestic shipping fee will be included into the international shipping fee, therefore please take special care in noting such conditions, especially the weight on the item. For more details, please refer to Shipping Fees. If you have any questions or concerns, feel free to contact us. The international shipping fee is equal to the actual fee required to deliver your items from our warehouse to your home. Please take special notice on the weight of the item since that will define the international shipping fee. For more details, please refer to Shipping Fees. If you feel the shipping fee is too high, you could consider shipping via sea, but it will take longer to reach you. If you have any concerns or questions, please feel free to contact us, we are here to assist you all the way! We do our best to offer assurance on the safety of your purchased package, however, we are unable to guarantee your package is securely delivered with enough care. Thus we would like to offer the option of placing an insurace claim on your package to optimize the safe delivery of your package. For more details, please refer to Insurance & Return. Every time an auctioned item is won or an online item is bought, the seller will be charged a 8% sales tax of the ending or purchased price. The seller usually pays this fee, however in very rare circumstances a seller may charge this fee to the winning bidder. However, this condition is displayed directly on the item page, thus you will be aware of it before any purchase. Any customs and import duties will be charged once the parcel reaches its destined country and must be paid by the recipient. These charges must be paid by the recipient of the parcel. For more information, please contact your local customs office for current charges before you order Furthermore, any other associated cost (not included in the above) will be concluded in this section. Custom tax polices vary from country to country. At Mogan Shopping, we aim to offer you maximum assistance by reducing item costs by avoiding custom taxation. During the package delivery process from the Japan seller to our international warehouse, no custom tax is included. Unless we are informed to mark the item at a lower price, we will send your items internationally in the original condition as when we received it. In rare cases the item package will be checked by customs when it arrives at its destined country and an extra tax fee will be incurred,paid by the buyer. Mogan Shopping will not accept any rejection of items due to possible high custom taxation. Rarely does a seller request for a packing fee. If so, it would be displayed on the item page, typically for very fragile items. Normally, we ship items without repackaging as we receive them at our Japan warehouse. If you need repackaging for additional protection, please specify this in My Account > Order Info > All Orders> select the item, type of package and select repackage before your order reaches our warehouse. For more details, please refer to About My Order. The premium of the "cargo damage insurance" is about 1-10% of the merchandise cost, i.e. the amount that the buyer paid while the first stage of purchase procedure. Once the buyers choose the request to enhance the packaging level, they could decide to increase the insured value. General merchandise – the compensation will be 10% of the merchandise cost if the insured value is 1% of merchandise cost. Pls. note: The maximum compensation amount of merchandise price is NT$ 50,000. Antiques, fragile items, precision machinery and other easily damaged goods – the compensation will be 60% (in max.) of the merchandise Cost if the insured value is 6% of the merchandise cost. Once the merchandise arrive Taiwan, "Mogan Shopping" provides 28 days' storage service for free. If the buyers do not settle the payment within 28 days upon the merchandise arrival, the storage fee of @50 yen per day will be charged,and the buyers do not settle the payment within 60 days upon the merchandise's arrival, "Mogan Shopping" will need to dispose the merchandise and the down payment the buyers have paid is non- refundable.Please be alert of this,If member still wants to keep the ownership of this item, please contact Mogan shopping when you have time ,to ensure your rights. As soon as your items arrive at our Japan warehouse, the 2nd payment will be shown, in full, in your Mogan account along with an email notice requesting you to check your account. Once you see this, please follow the steps below to complete the checkout process. Sign in and go to 'My Account'. If any items are waiting for 2nd payment, a notice will be displayed at the top of in your 'Inbox' such as, '1 item(s) have arrived at our warehouse, please check 2nd Payment & Checkout'. Click the 'Checkout' link to view all items pending 2nd payment. Click any item order number to view its 2nd payment breakdown. Verify the amount and details, go back to Non-Checkout Order page, select the order checkbox and click 'Checkout'. Alternatively, you can 'Select All' and Checkout all pending orders. Once all payments are cleared, your items will be processed and sent internationally. Note: If you selected our auto-system checkout, the above steps will be done automatically for you.